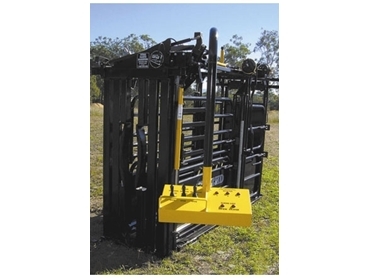 The EHD Ultimate Air-Hydra from RPM Rural Products is a cost effective and simple cattle crush. Thanks to a unique hydra-lock technology handling with this model is as easy as the push of a button. Fitted to the head bail, squeeze and rear door of the crush are air-powered brake servos which can be operated from a centrally located remote control panel. This panel can be located on either a swing arm that moves as you move for optimal positioning or on a remote pedestal. The remote is also able to be operated manually in the event of a power cut. The control panel means that one worker can perform the tasks that would usually require two so labour costs are significantly reduced. The Air-Hydra Crush won the 2001 Australian National Field Day “Kondinin Group Award of Excellence” and “The Land – Machine of the Year” awards on it’s debut.